As a leading EDI provider focused on supply chain and eCommerce procurement, Logicbroker strives to provide visibility to transactions and the associated documents for our clients. However, there are certain EDI documents that fall outside the scope of standard integrations. To avoid custom mapping or development charges for our clients, Logicbroker simply passes an unsupported document via email as an attachment. Please be sure that you are subscribed within the Logicbroker portal to receive this email. 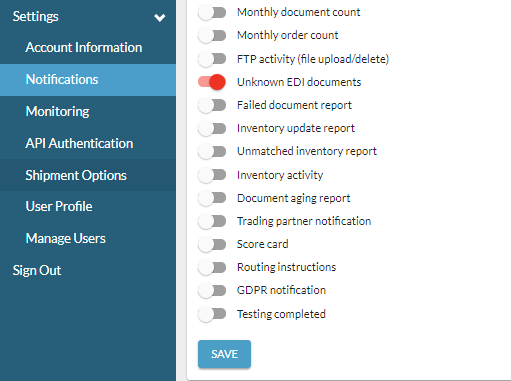 You may find this by going to Settings > Notifications and ensure that Unknown EDI documents is turned on and hit Save. We also keep this information under the Events section of the portal. If you navigate to the message center > Events you can see the unsupported document that was received and may view the details there as well. To open EDI documents, simply download and install the program, save the EDI file you would like to open with the file extension “.edi”, and open the file in EDI notepad. Most clients find this method to be an easy way to manage the occasional exception.